“It’s a problem I have. When you’re ten years old and dangling from a cliff while rabid hyenas circle below, you learn to be stubborn. You can’t quit, because quitting isn’t an option. You dig your fingernails and pray that root doesn’t come loose. And if it does, you plan how best to fend off hyenas when all you have is a Pez dispenser and a priceless diamond in your pocket. I fight. It’s what I do. It’s how I survive. When people turn and run, I go forward. It’s kept me alive so far, but it’s skewed how I look at things. Having fought for the ability to have a normal life in The Last Adventure of Constance Verity Connie’s out to try to have one. Which is harder than saving the world a few times a week. She’s still saving the world regularly, as well as having all sorts of adventures. She’s trying to settle down with her boyfriend Byron the accountant, while relying on her best friend/sidekick Tia some more (all the while, Tia is trying to strengthen her relationship with her ninja-thief boyfriend, Hiro). There are evil geniuses, aliens, robots, and vampires living in her condo — all of them behaving themselves, thank you very much. One of the activities that takes most of Connie’s time right now is trying to help out an old friend cleanup the supercriminal organization that he’s in charge of now that his mother has apparently died. There’s a lot of rogue agents, assassins and experiments that need cleaning up if the organization is going to be come a legitimate force for good — or at least not a force for evil and chaos in the world. Connie’s tempted to spend more time doing that than she should, to the detriment of her relationship with Byron. Thankfully, Tia’s there to help keep her priorities in order. Hopefully, that’ll be enough. You ever find yourself eating something — say, some cake — and you’re not sure if it’s too rich, if the frosting is too sweet? And then you realize how stupid you sound? Wondering if the cake is too good? Well, that’s the experience I had with this (and, I’m pretty sure with the previous Constance Verity book) — where there too many quips? Too many (seemingly) random ideas, aliens, evil masterminds, robots, henchmen of a variety of stripes, strange occurrences? What a stupid thing to ask. Yeah, there’s a lot going on, but it actually doesn’t get to the overload status. It may come close, but it stays on the right side. It’s like asking if there are too many animated personages in Who Framed Roger Rabbit?, if there are too many Easter Eggs in whatever your Super-Hero movie of choice is. No, there’s not — there’s a lot of good things that are fun. Shut up and enjoy. 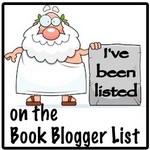 Really, that’s the worst thing I can say about the book — occasionally, there are too many fun things happening. 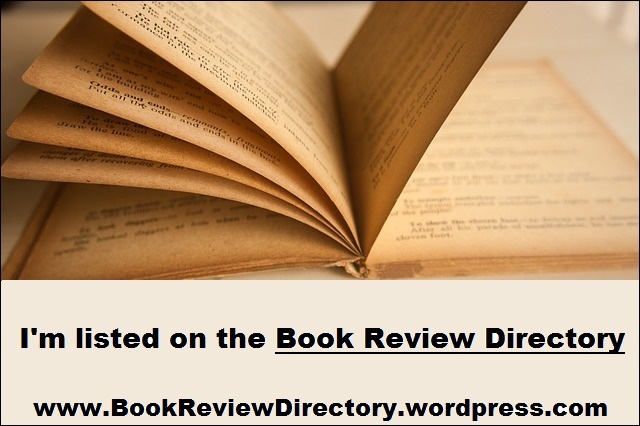 The pacing is great, the characters are rich, lively, and well-developed (including many of those only around for a page or so), you’ll laugh, you’ll be moved, you might even have a thought provoked. It’s just a charming book set in a delightful world. Do not make the mistake of thinking this is a romp, just a free-wheeling ball of fun, snark and self-referential humor. 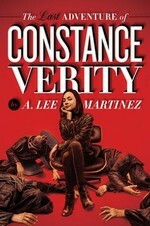 It’s an A. Lee Martinez book, so yeah, there’s a lot of that — but laying underneath that is a good story, some interesting ideas about relationships, about trust, about fate. A whole lot of other things, too, I’m sure, but let’s stick with those. Too many people will read this, focus on the “fun” stuff and will miss the very thoughtful portions — it’s Martinez’ strength and weakness that it’s so easy to do with his works. There’s nothing wrong with a silly adventure story, and there’s nothing wrong with a book that’s about something. But when you have a novel that’s both — you should pay attention to both. I knew Martinez could write a series if he wanted to — I had no idea what it was going to look like when he did. I’m glad I got the chance to find out. 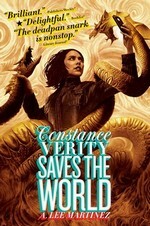 Constance Verity Saves the World is equal to its predecessor in every way that it doesn’t outdo The Last Adventure of Constance Verity — which is no mean feat. It’s fun, the characters are better defined and have grown some, and there’s never a dull moment. Constance Verity, the caretaker of the universe, the Legendary Snurkab, possibly the only woman with more titles than Daenerys Targaryen, is a character you need to get to know. Her sidekick Tia is, too. I cannot wait to see what the two of them do next.